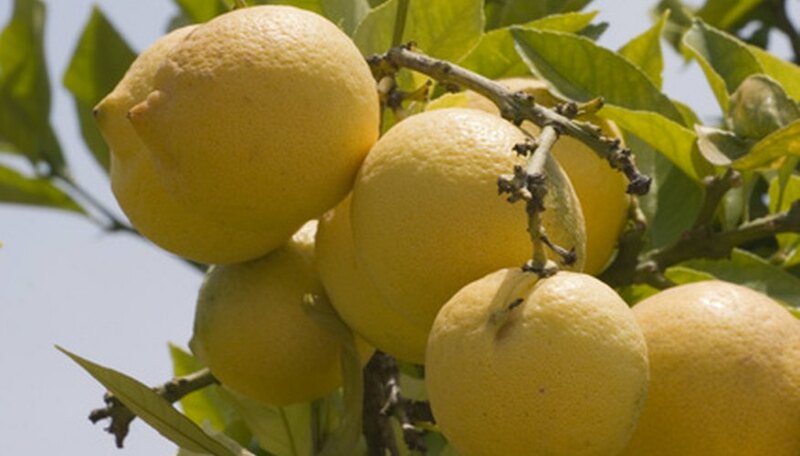 Fertilizer helps keep citrus trees healthy and productive. It's a necessary part of maintaining your citrus tree. While the exact type and amount of fertilizer you need varies depending on what you're growing and the condition of your native soil, there are general guidelines and best practices that can get you started in caring for your tree. Citrus trees need nitrogen and phosphorous--more or less amounts of these two nutrients depending on your type of soil. The University of California Davis recommends applying 1 to 3 lbs. nitrogen fertilizer (in the form of ammonium nitrate) annually and 1 lb. phosphorous every three to four years. Young citrus trees--those two to three years old that don't yet set fruit--need less fertilizer than mature trees. The University of California Davis advises giving two-year-old trees 2 tbsp. of nitrogen three to four times a year, then giving them 6 tbsp. three to four times a year the third year. Thereafter, use the amounts for mature trees. You can apply the nitrogen all at once, in late winter, or break it up into several applications throughout the growing season. Applying 1/3 of the nitrogen needed in February, July and September makes a good schedule. Choose your preferred time frame for fertilizing. The only way you'll know exactly what your soil needs to support a citrus tree is by obtaining a soil test. Contact your county extension agent to arrange a complete soil test. This will tell you the pH of your soil, the level and type of toxins in your soil and what to use to fertilize the soil. Your county extension agent can use the complete soil test to advise you whether you need more or less nitrogen and phosphorous, or if your soil pH needs adjustment. Gardeners may be tempted to substitute manure or compost for nitrogen fertilizer, since these things are high in nitrogen. The University of California Davis cautions against using high amounts of chicken or cow manure since they contain a lot of salt. The salt can burn the tree trunk and roots. However, you can substitute 1 gallon of manure for the nitrogen when fertilizing young trees. Lemons requires more nitrogen than other types of citrus fruit. Generally speaking, oranges and grapefruits require 1 to 1.5 lbs. nitrogen a year, while lemons require 2 to 3 lbs.